Our polling of more than 100 political insiders on the upcoming state elections. By David S. Bernstein·	 2/4/2014, 11:17 a.m.
On Groundhog Day, my network of more than 100 political insiders saw their shadow and predicted seven more months of campaigning for 13 of the 16 Democratic candidates for four open statewide offices. They predict that four candidates for governor will appear on the September primary ballot, along with four for lieutenant governor, three for attorney general, and three for treasurer. To get there, those pols must survive the upcoming party caucuses; collect nominating signatures across the Commonwealth; receive support from at least 15 percent of delegates at the June convention; and survive all manner of obstacles along the way. Yes, someone thinks the current frontrunner, Attorney General Martha Coakley, will fail to make it to the primary. But otherwise it’s a clean sweep for her and Treasurer Steve Grossman. And in a bit of a surprise, the vast majority of insiders also now believe that first-time candidate Juliette Kayyem is going to stick around for the long haul. Well over half say that health care executive Don Berwick, who insiders say is sparking a fire with liberals—who dominate the party process—will make it a four-way race for the nomination. The insiders do not, however, see a path for the other health care executive in the field, Joe Avellone. Warren Tolman is the well-known political veteran returning from the private sector. Maura Healey is the political novice coming straight from a prosecutor’s role. And Hank Naughton is the sitting lawmaker tapping his political network. They make for an interesting clash of characters in this race, and most insiders think all three will make it to the September ballot. 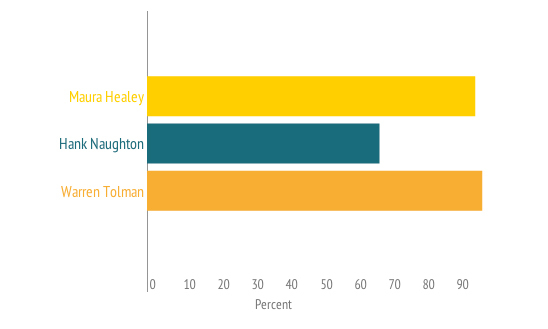 Their confidence in Tolman is not surprising, but the faith in Healey shows how much inroad she has made with party progressives. Meanwhile Naughton’s stock has dropped with many of these insiders, but most still think he’ll at least make his way onto the primary ballot. 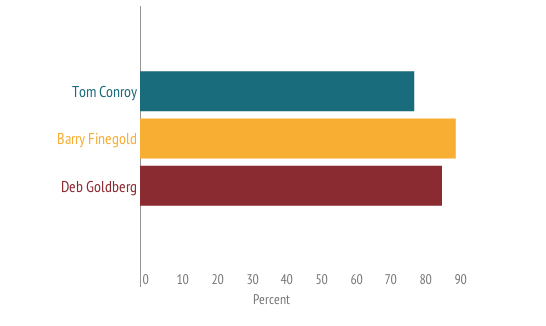 Insiders seem to be leaning toward state senator Barry Finegold eventually winning the nomination, but most believe that Deb Goldberg and state representative Tom Conroy will make the ballot with him—and that in the relative obscurity of the race, almost anything could happen. (Several mentions were made of Tim Cahill’s rise to the Treasurer nomination in 2002.) 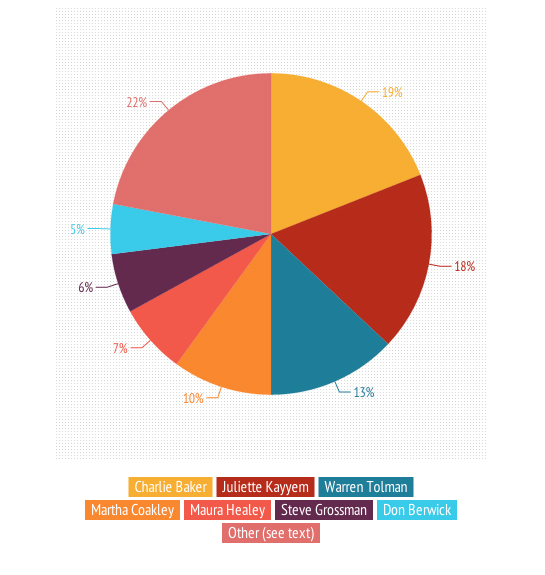 Interestingly, 13 percent of insiders said that someone other than those three would make the ballot as well, although most seemed to be thinking of Braintree mayor Joe Sullivan, who has now decided not to run. 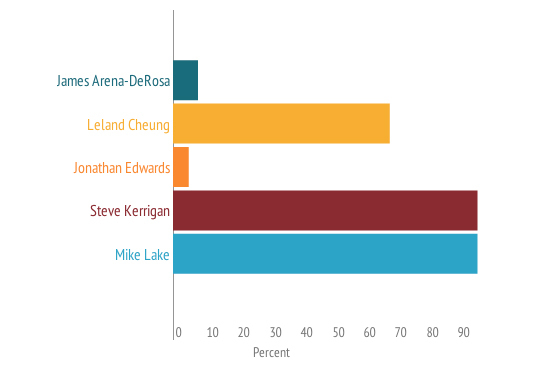 Insiders still see this as a two-person race between Steve Kerrigan, who they see as the likely nominee; and Mike Lake, who they see as the Democratic activists’ favorite. Three other candidates have jumped into the contest late; the insiders see only Cambridge city councilor Leland Cheung as likely to get on the ballot—although some made strong arguments for either James Arena-DeRosa or Jonathan Edwards. Meanwhile, a full 21 percent still think someone else will swoop in and join this race. Which candidate is having the best year so far? I also asked the insiders to name the one 2014 candidate—any race, any party—who has had the best year so far. That prize went to a Republican: Charlie Baker. Baker, the GOP candidate for governor, was the choice of 19 percent. Close behind him was underdog Democratic challenger for the same office, Juliette Kayyem, with 18 percent. 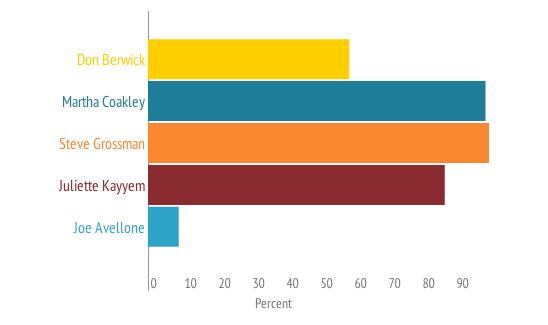 Warren Tolman, running for attorney general, was next with 13 percent; then Martha Coakley (10 percent), Maura Healey (7 percent), Steve Grossman (6 percent), and Don Berwick (5 percent). Others receiving more than one vote were Katherine Clark, Steve Kerrigan, Mike Lake, Ed Markey, Seth Moulton, and Karyn Polito. Participating Insiders include (affiliations for identification only): Elaine Almquist, Young Democrats of Massachusetts; Jim Aloisi, Kanaan Consulting; Jason Aluia, Mass. Association of Health Plans; Brent Andersen, GOP state committee; Jay Ash, Chelsea city manager; George Bachrach, Environmental League of Mass. ; Matt Barron, MLB Research Associates; David Begelfer, NAIOP Mass. ; Gus Bickford, Factotum Productions; Alexander Bok, Boston Baseball Field of Dreams; Beth Boland, Foley & Lardner; Ian Bowles, Windsail Capital; Larry Carpman, Carpman Communications; Gregory Casey, former Scott Brown staff; Jamie Chisholm, Resolute Consulting; Shawn Collins, office of state senator Richard Moore; Nick Connors, NLC Consulting; Brian Corr, Cambridge Consulting Services; George Cronin, Rasky Baerlein Strategic Communications; Sean Curran, Waterville Consulting; Kate Donaghue, Democratic State Committee; Ray Drewnowski, 1199 SEIU; Shawn Duhamel, Old Colony Group; Dee Dee Edmondson, Edmondson Strategies; Mike Festa, AARP Massachusetts; Peter Forman, South Shore Chamber of Commerce; Joseph A. Giannino, Government Relations Group; Charles Glick, Charles Consulting Group; Alex Goldstein, Northwind Strategies; Abbie Goodman, The Engineering Center; Rob Gray, Gray Media Group; David Guarino, Melwood Global; Joseph Hanley, McDermott, Quilty & Miller; Lee Harrison, Democratic State Committee; Emmett Hayes, Smith Ruddock & Hayes Public Policy; Mathew Helman, ProgressMass; David Howard, DH Consulting Group; Richard Howe, Middlesex North Register of Deeds; Diana Hwang, Asian-American Women’s Political Initiative; Dominick Ianno, Pfizer; Chris Keohan, CK Strategies; Liam Kerr, DFER Mass. ; Christina Knowles, Mass. Caucus of Women Legislators; Scott Lang, Lang, Xifaras & Bullard; Matt LeBretton, New Balance; David Linsky, state representative; Jay Livingstone, state representative; Bill Manzi, Methuen town manager; Cayce McCabe, political consultant; Mike Morris, Beacon Strategies Group; Mary Olberding, Hampshire Register of Deeds; Matt O’Malley, Boston City Councilor; Lora Pellegrini, Massachusetts Association of Health Plans; Frank Perullo, Sage Systems; Sean Pierce, office of state senator Linda Dorcena Forry; Larry Rasky, Rasky Baerlein; Stan Rosenberg, Senate Majority Leader; Tim Schofield, Schofield & Campbell; Stephen Silveira, ML Strategies; Helene Solomon, Solomon McCown & Company; Karen Spilka, State Senator; Nancy Stenberg, Massachusetts Teachers Association; Jon Tapper, Melwood Global; Charlie Ticotsky, Metropolitan Area Planning Council; Steve Tompkins, Suffolk County Sheriff; Paul Trane, Telecom Insight Group; James Vallee, Nixon Peabody; Marty Walz, Planned Parenthood League of Massachusetts; Meredith Warren, Lyric Consulting; Alice Wolf, former state representative; Conor Yunits, Liberty Square Group; Reggie Zimmerman, MassUniting; Scott Zoback, office of Congressman Jim McGovern; and others who requested anonymity.